At the time, Monsters Inc (2001) was not received lovingly by the critics, lets face it – Toy Story, A Bugs Life and Toy Story 2 were hard acts to follow. Much of its warmth has since been felt from repeat DVD viewings over the past ten years. Guillermo Del Toro is a director known for the fantasy filled worlds he creates on screen, and Pacific Rim is no different. When Kaiju, giant alien sea monsters, arrive to attack earth from a portal at the bottom of the ocean, humanity reacts by building giant robots, or Jager (German for Hunter) are piloted by 2 people and this is where we meet Raleigh Becket (Charlie Hunnam). Known for his fighting skills Raleigh, somewhat a maverick, soon finds himself at a loss after one battle leaves him feeling alone in the world. 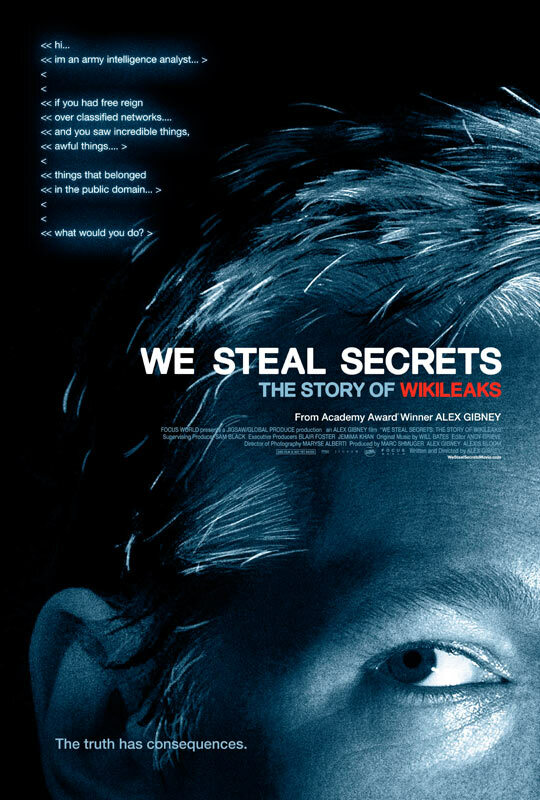 We Steal Secrets: The Story of Wikileaks is the new film by Alex Gibney, the established director/producer whose credits include Enron: The Smartest Guys in the Room (2005), Freakanomics (2010), and the upcoming Lance Armstrong: The Road Back. The film documents the rise to fame (or infamy) of Julian Assange, poster-boy for the Wikileaks organisation, and his many international exploits over his career. Delving into his past as a computer hacker in Australia as a teenager, to his current whereabouts in the Ecuadorian embassy, the film packs a very large amount of information into its running time. As well as Assange, the film looks at Bradley Manning, the US Army soldier who leaked a huge amount of information to Wikileaks, and propelled the organisation to fame. The Internship reunites Vince Vaughn and Owen Wilson on screen in a comedy about 2 older guys who lose their jobs and battle to get an internship at Google and quickly realise just how out of touch they are when surrounded by younger, brighter counterparts. Gru and his loveable minions are back in Despicable Me 2, a film which is as charming as it is funny. After turning over his new leaf in Despicable Me Gru is now the model father, looking after his 3 daughters and investing his energies into positive activities, but when he is called upon by the AVL (Anti Villain League) to help conquer a dangerous new criminal he inadvertently tackles a whole new area of life. Summer in February is a small British romantic drama telling the true story of an artists colony in Cornwall. Dominic Cooper leads the young British cast as the famed artist AJ Munnings with Emily Browning playing Florence Carter-Wood, Munning’s doomed lover and Dan Stevens takes up the role of Gilbert Evans, the third side of the love triangle that dominates the story. The filming is simple and uncomplicated, relying on the natural beauty of the set to enthrall the viewer and play a role in the story that was so vital to the artists being represented on screen. A decent enough production also means that the costume and sets appear to be authentic and despite the Edwardian time period of the film it’s accessible and creates a clear world for these characters. While inspired by true events and as a result a clearly strong idea at the heart of the film the plot loses its way on occasion and jumps past, seemingly key developments, straight to the outcome leaving the viewer a little perplexed at times. It is however important to note that the cast, specifically Dominic Cooper put on a great show. His ability to adapt to characters and embody them fearlessly make his portrayal of Munnings captivating and yet somewhat repelling all at the same time. The supporting cast also make this film feel like these people are real, and therefore ultimately do credit to the people whose stories they tell. Despite all of this something about the film makes it fall slightly short, it doesn’t seem to offer anything new and the jumps in the story mean it fails to stand out. Summer in February is charming but ultimately unmemorable and while this film may capture the hearts of art lovers and enduring romantics while its on screen but sadly you take little other than Cooper’s execution of his character.